Pleasant View, located in Cheatham County, was formerly known as "Bradley's Stand," as well as, "Turnbull Horse Stamp." The mail and telegraph lines ran from Clarksville to Nashville and the Town of Pleasant View served as a stagecoach stop and rest area between the two cities. 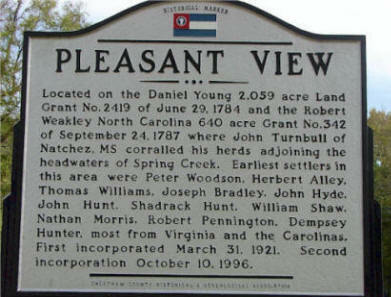 The Town was named Pleasant View by a group of citizens in 1870. In 1886, Pleasant View had a population of nearly 300 people and had emerged as the seat of tobacco factories, as well as, a large loose leaf tobacco market. Pleasant View was incorporated under a house bill in 1921 and consisted of approximately 105 acres. The local government consisted of a mayor and six aldermen and was divided into three wards. The Town was unincorporated ten years later. In 1996, the citizens of Pleasant View voted to re-incorporate under a public act Mayor/Aldermanic Charter. If you are looking for a REALTOR® who knows Pleasant View, choose Kim Blanton! Learn more about Kim and why she is the best choice to assist you with all of your home buying and home selling needs.